The Government Accountability Office’s assisted living-related report, home- and community-based services, emergency preparedness, elder abuse, workforce development and opioids all were to be topics highlighted during the second day of Argentum’s Public Policy Institute & Fly-In, which was canceled last week due to inclement weather. Argentum is formulating some alternatives for the fly-in part of the two-day event, Argentum Chief Operating Officer Maribeth Bersani told McKnight’s Senior Living. The Public Policy Institute took place the day before, on March 20, and included discussions of many of the same topics. The national organization, however, also had scheduled almost 40 meetings between Argentum member community representatives and legislators on Capitol Hill for March 21. Participants also had planned to meet with representatives from the Department of Health and Human Services’ Administration for Community Living, which includes the Administration on Aging, and Centers for Medicare & Medicaid Services. Bersani said that, in light of the canceled fly-in, members were encouraged to meet with their legislative representatives in their home districts. Argentum will set up individual meetings on Capitol Hill if any members return to Washington, D.C. A conference call will be organized for the ACL meeting, she said, and the CMS meeting will be rescheduled as well. The focus of the ACL and CMS meetings will be the HCBS rule, Bersani said. “It’s being implemented slightly differently in different states,” she said. Additionally, the meeting with CMS will include discussion of the recent GAO report on assisted living, Bersani said. In that report, the GAO made recommendations to CMS on ways the agency could help states improve their monitoring and reporting of deficiencies and critical incidents in assisted living, including standardizing Medicaid reporting requirements. “We agree with the GAO report recommendations [that] there needs to be better communication and coordination with CMS and the Medicaid agencies,” Bersani said. She noted, however, that Argentum wants to ensure that government officials are aware that the GAO report calculates the number of assisted residents differently than does the Centers for Disease Control and Prevention. The CDC does not include in its total younger people who have intellectual or developmental disabilities or traumatic brain injuries. Argentum uses the CDC’s statistics. Although fly-in meetings with staff members who work for the four senators who requested the GAO report — Susan Collins (R-ME), Orrin Hatch (R-UT), Claire McCaskill (D-MO) and Elizabeth Warren (D-MA) — were canceled, Argentum representatives have been able to meet with the staff members, Bersani said. Bersani said that she had hoped that during the fly-in, members could help senators’ staff members better understand how the Medicaid program is administered in the various states, since it varies by state. Emergency preparedness and elder abuse were other issues that were priorities for this year’s fly-in, Bersani said. Argentum members from Florida and Texas were going to meet with their senators to relate Hurricane Harvey and Irma success stories and explain how they decide whether to shelter in place or evacuate. “It’s not just hurricanes, obviously,” Bersani said. “It’s wildfires, and it’s active shooters.” Those topics were discussed at the Public Policy Institute by Caitlin Soto, oversight counsel from the Senate Committee on Finance, she added. Elder abuse, Bersani said, is especially on the minds of members in Wisconsin and Minnesota due to actions by governors and attorneys general there. A new effort in Wisconsin will encourage the public to report cases of elder abuse occurring at Medicaid-funded and other senior living and care facilities, Wisconsin Attorney General Brad Schimel announced Jan. 5. 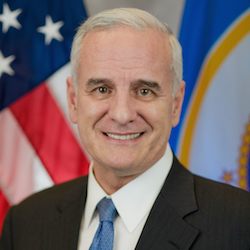 And earlier this month, Minnesota officials unveiled a $14.9 million plan that would result in increased assisted living and memory care community licensing requirements. And the national opioid crisis, Bersani said, has operators thinking about medication management and disposal as well as scams in which family members divert residents’ drugs to themselves. As mentioned, Agentum still was able to hold its Public Policy Institute as planned. Attendees heard the keynote speaker, Virginia Attorney General Mark Herring, discuss financial fraud and scams as well as the country’s growing opioid epidemic. Panel discussion topics included medication management, workforce issues, emergency preparedness and the upcoming midterm elections. Panel speakers in addition to Soto included Tonya Cloutier from Brookdale Senior Living; Andy Coelho from Sunrise Senior Living; Cece Credille from Enlivant; Jim Ellis of Ellis Insight; Ann Morse from the the National Conference on State Legislatures; Juli Navarrete from Sunrise; Haley Nicholson from the NCSL; James Redstone, the workforce development lead from the House Committee on Education and the Workforce; and Ben Voelkel from the office of Sen. Ron Johnson (R-WI).